As the summer season in Punjab begins, adventure-seekers from across the country swarm the spectacular valleys in Swat and Upper Dir. My plan of escape was to Katora lake located in Upper Dir in mid of August. I had never visited Pashtun north areas in my life the selection added excitement as well as raised plenty of questions. Afterall I was excited that I was going to explore the unique culture, people and espacially their food which I have heared about alot. From Lahore, you have two options to reach the starting point of the trek (Jandari), take Daewoo Pakistan to reach Batkhela and then take a jeep to Jandrai. The other option is to take Sanan Daewoo to reach Dir and take a jeep to Jandrai. The second option is highly NOT recommended because of certain reason which can not be explained here. 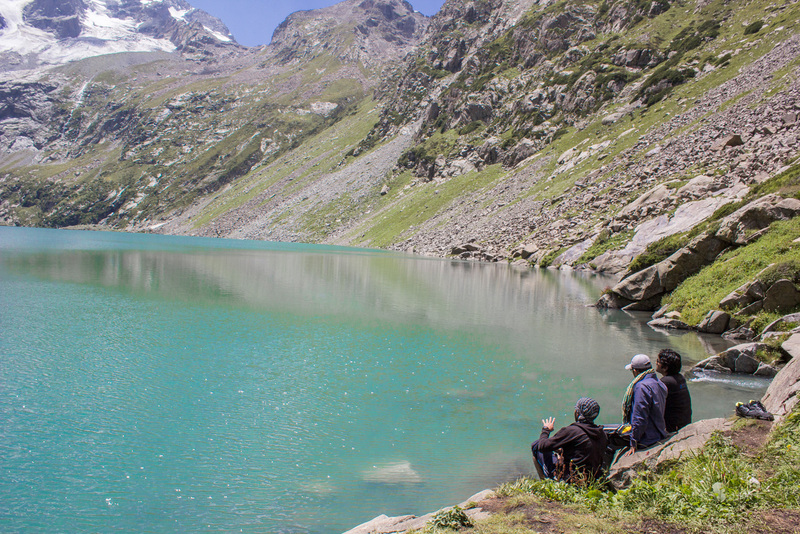 The trek requires hiking for two days to reach the Lake. 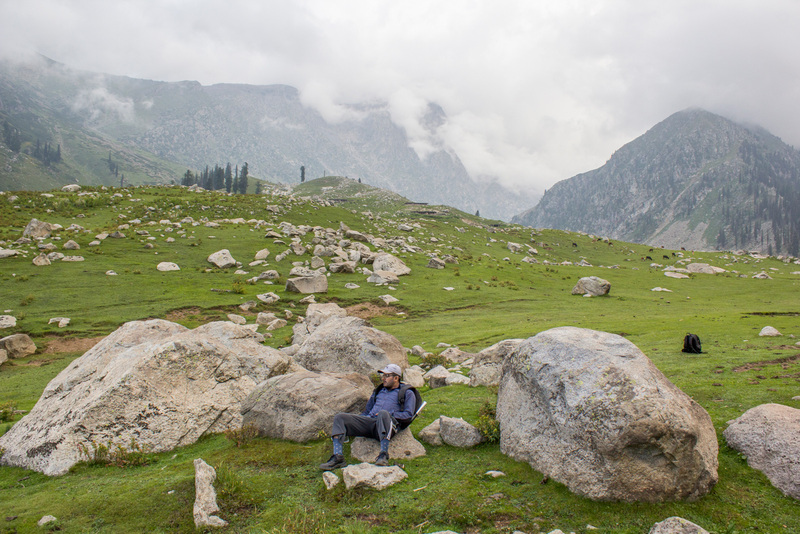 The first day, 6-7 hours of long hike leads you to the meadow called Jahaz Banda. The lush green meadow offers you huts and a rest house for an overnight stay, alternatively, you can pitch a tent as well. 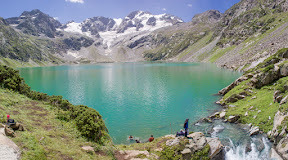 The second day, 3-4 hours hike is required to reach Katora Lake. What we did well actually, we added an extra day into our plan for compensating any unplanned (uncertain) events. Here is the elevation profile of the trek starting from Jandrai to Katora Lake (Thanks to Google Earth). 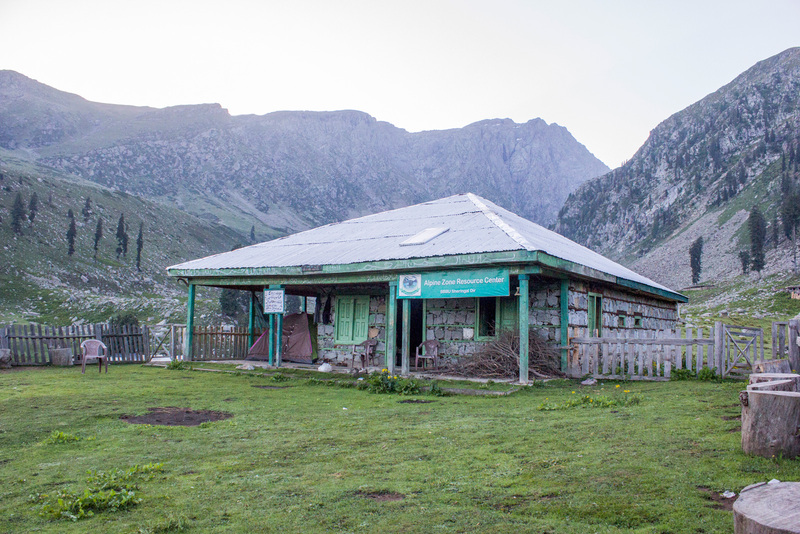 At Jandrai, Raja Taj Muhammad who is the primary contact for all tourists and trekkers visiting the area provides guidance & help to the tourists. 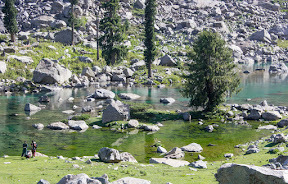 If you are planning to visit Kumrat valley, he is the first person you should talk to. Raja Taj is an interesting person who does not let you get bored or unoccupied through his continuous chat and hospitality. 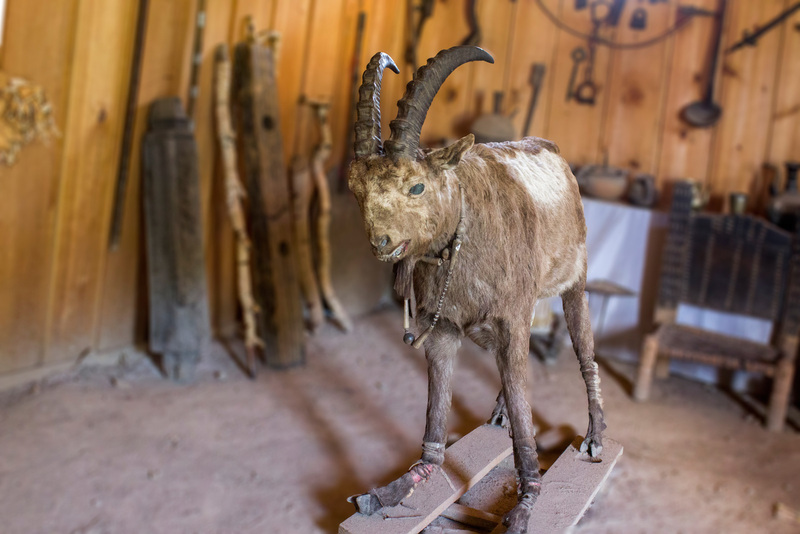 He has got this local museum built at Jandrai showcasing stuff belonging to his forefathers ranging from guns to stuffed hunted species and clothing. 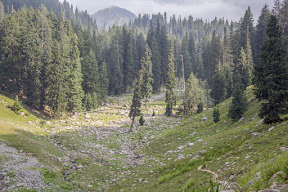 This is quite a site to visit in one of the remote areas of Kumrat valley. Raja has set up a few guest rooms at both museum and his home, to provide basic accommodation to the trekkers. which is indeed a treat to find for trekkers. He has also got a hut built at Jahaz Banda meadows where there are a couple of rooms set up. 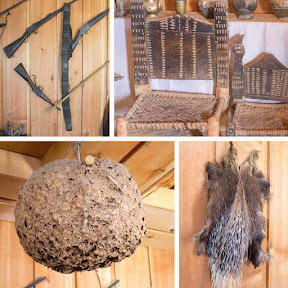 These guest rooms are not luxurious, but given the circumstances and remoteness of the area, they become a luxury for trekkers. Raja can arrange porters and other trekking requirements as requested. He can be reached at numbers 0346-3133466 & 0321-9176378. 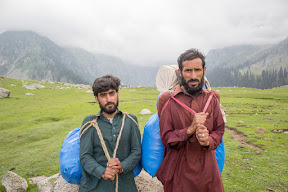 The trek started from Jandrai village after spending a night in the beautiful Kumrat valley where we camped on the bank of the *Panjkora* River. 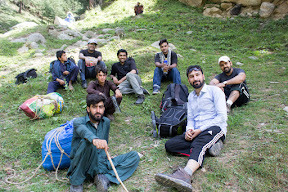 I along with my friends (Adnan, Afzaal, Hussnain, Noraiz, Uzair) was excited to meet local people and camping in the remote valley of Kumrat. We took three porters along our side and left from Jandrai around 11:30 am. The start of the trek was rocky and steep; inexperience of such trek added more difficulty for us. During initial 40-50 minutes, we understood this will not going to be easy; it will require our lot of courage (With the certain events happened during the trek, our patience was tested). 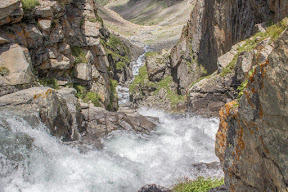 The trek passes through the village and moves along the stream gradually before crossing a bridge and entering into the dense pine forest and ascends steeply. This ascent continues until it opens up into the lush green meadows of Jahaz Banda. At the start of the trek from Jandrai village. After all the hardship and hours of hike, the trek opens up in the wide meadow. Overlooking the rest house from Jahaz Banda meadow, Upper Dir. We reached Jahaz Banda meadows before it was too dark covering the distance in roughly 6.5 hours. 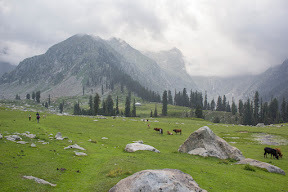 The sight of the meadows was a spectacular one, a lush green meadow surrounded by high peaks and sky covered with dark clouds with sprinkling rain; welcome to the Jahaz Banda Meadows. All the hardship of the trek, passing through the steep & dense forest, crossing stony patches and the continuous search for cold sweet water spring ends when you reach there. 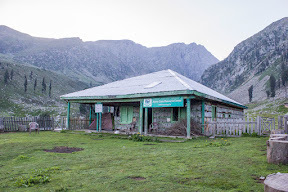 The rest house is still 20 min far from the meadow; Imagine the trekking on the flat green meadow, overlooking a rest house and a stream of fresh water flowing just a side of the meadow Alhamdulliah, It is hard for me to sum up my experience into words. It was just “beautiful”. We reached at the resthouse at 730PM and rain started to pour, everyone rushed to find a shelter. For the dinner, we arranged & prepared BBQ ourselves. It was beyond expectations to cook such a meal at a place so remote. 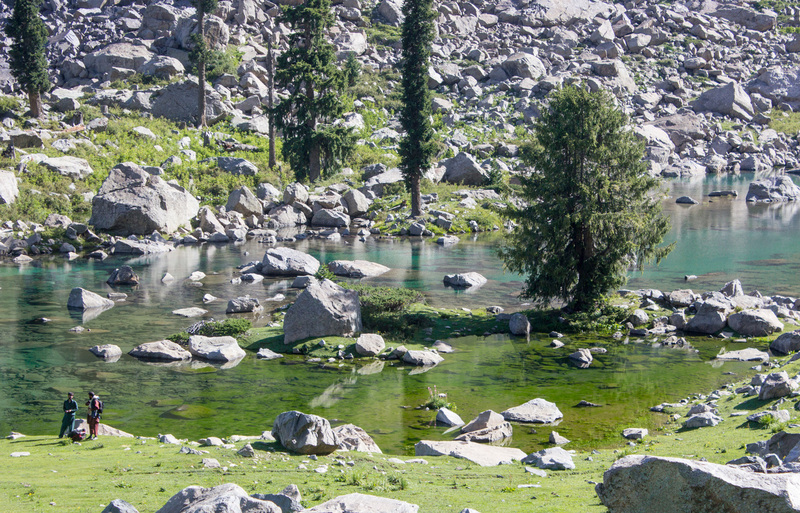 Beautiful ponds on the way to the Katora Lake, these ponds are no less beautiful than Naltar Lakes in Gilgit Baltistan. 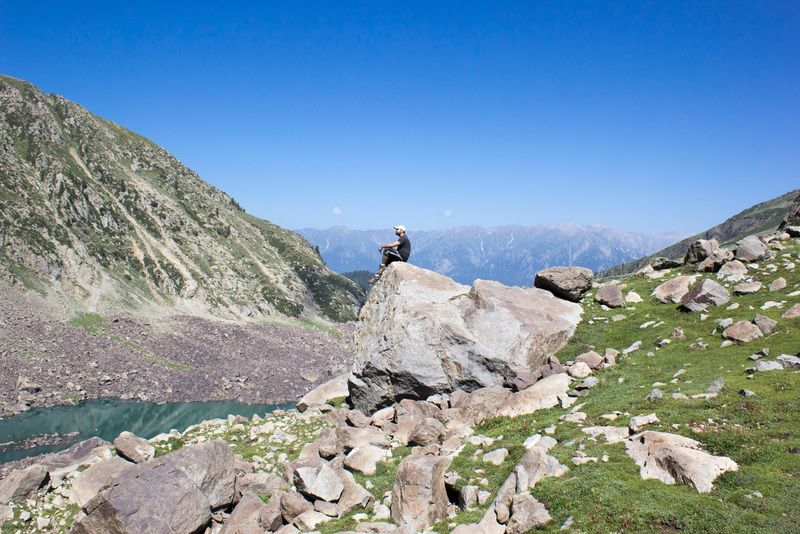 A bright and clear day welcomed us when we were going to attempt Katora Lake trek. Being relatively shorter than the Jahaz Banda trek, it was no less difficult. We suppose to trek to the lake and return to the Jandri village today. We were climbing huge stones walking on stony meadows. 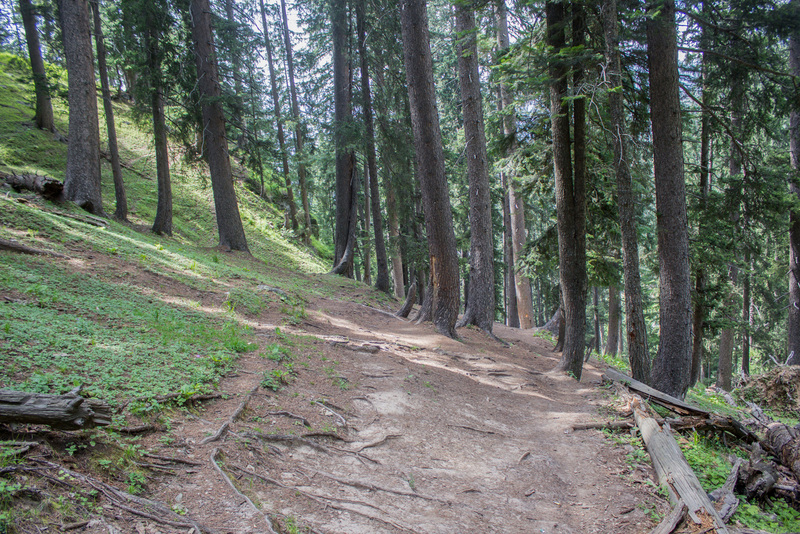 The majority of the path was along the side of the mountain; badly affected by floods and stones broke down over it. 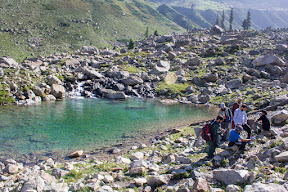 During the trek, you can see a couple of green & blue ponds of water which were not less attractive than Naltar Lakes in Gilgit Baltistan. Sitting on a stone and enjoying the wind touching the water and making a peaceful sound was an experience not to forget about. 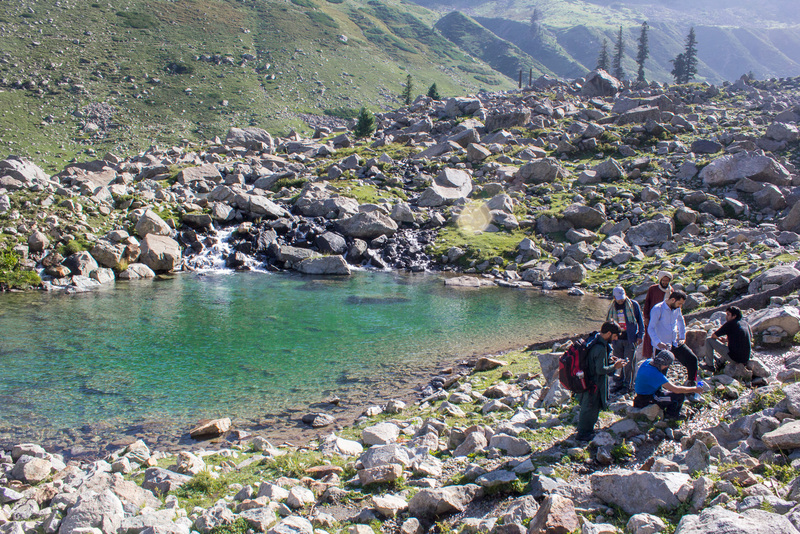 Jahaz Dand Lake deceives trekkers as if they have reached Katora Lake, Upper Dir. 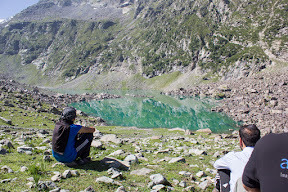 Before Katora Lake, Jahaz Dand Lake deceives the trekkers as if they have reached the Katora Lake. This neither small nor a less beautiful lake is surrounded by mountains from the both sides. We sat and saw the lake from the mountain which gave a bird's eye view of the lake. We cannot sit here for long, one of the porters said, we still have a distance to cover. 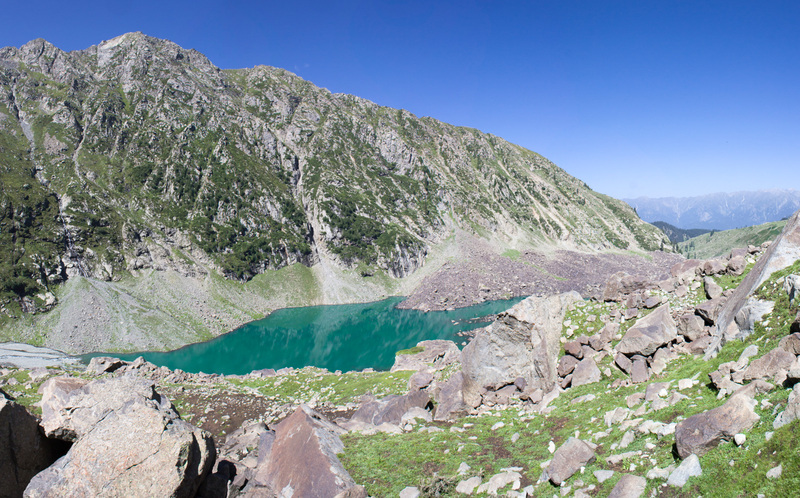 Far away, the spillover from Katora Lake was forming a waterfall, giving us a heading towards it. Just before the lake, you need to climb a steep hill, we helped each other in climbing the hill and we saw the lake uncovered itself from its vail. This is it!! 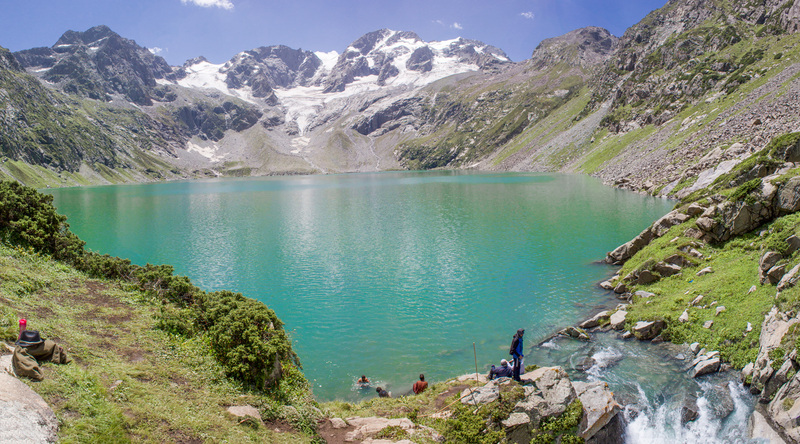 One of the porters said, “This is the destination you were trekking for, welcome to Katora Lake”. The lake was big and snow covered mountains were covering it from all sides. 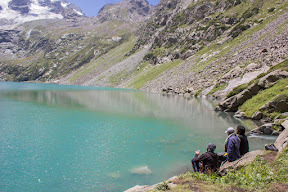 At the lake there is no way to camp, so whoever comes to visit, must trek back to Jahaz Banda or Jandrai. The spillover of the lake is mysterious, it is not something, which is naturally formed, and by my observation, the water made its way out of the lake by finding the most suitable direction. Excited and amazed, we sat there for a couple of hours saving memories; some were saved in mind and some were photographed for sharing with everyone who is interested. Porters played a huge role in the success of our trek; they were friendly, communicative and always motivating. “We are almost there”, they used to say when we start getting tired. They didn’t rush nor they put all of us in hurry. Steady as we go, we reached our destination. It was never possible without their support to accomplish the goal. The porters who played a key role in the success of trek. - Content and Photos by Author. After exploring "Golaghmuli village" early in the morning, my hunger made me find my way back to the hotel. “Anda-Paratha-Chai” was a perfect typical combination of breakfast served in the bright sunshine. It was expected to be a hot day, and the terrain to "Langar" was not expected to be friendly either. Dry and dusty mountains with steep ascents having no sign of trees were waiting for us. I was already exhausted in the rough and tough day when we reached Teru. 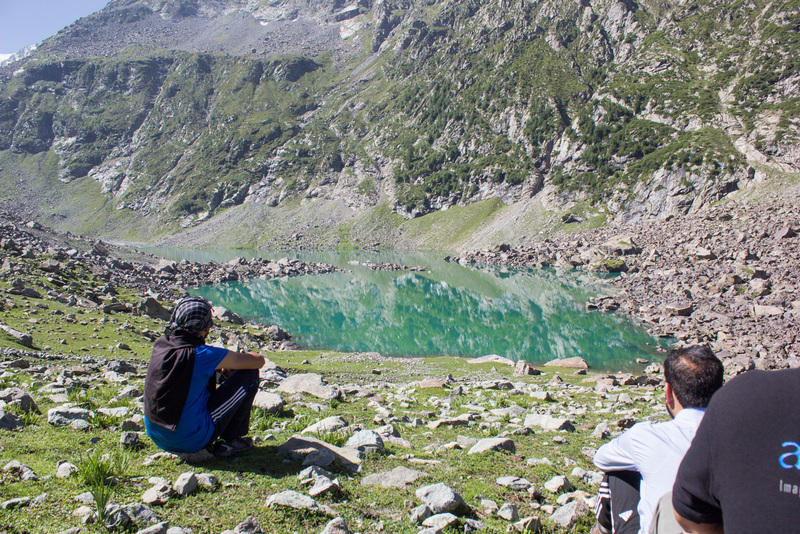 Phander is a beautiful and magical place, views of Phander lake from the isolated PTDC motel capture one's attention. Feeling the cool breeze sitting up at the motel can get anyone in trance and one can sit for hours watching it. The view becomes even more attractive at sunrise when the rays spread upon the natural water of the lake. Don’t tell me if you are a traveling insect and Pakistan is not in your bucket list. How is this possible? Pakistan is one of the most sensational places to hang your hat in, indubitably. 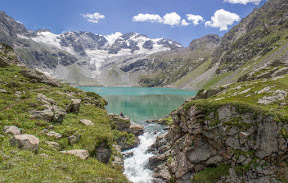 Hospitable people, rich culture, tantalizing street food, lush green forests, picturesque snow-capped Mountains and so on. That’s what Pakistan is all about.